Two years ago, at the end of the II International Ecomaterials Conference in Santa Clara, Cuba, Dr. J. Kuchena committed himself to organize an event in Southern Africa. 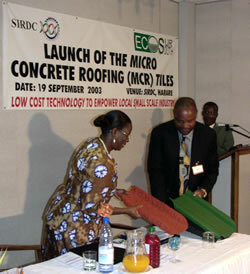 On September 19 he complied with a MCR Tiles Launch in Harare. Kuchena is director of the Building Technology Institute (BTI) at the Scientific and Industrial Research and Development Center (SIRDC) in Zimbabwe. The event was meticulously planned and publicized at the national level and so many people expressed interest that a month prior to the event they had to close the registration. Punctually, at 9 oclock in the morning, the director of SIRDC, Dr. R. Mafoti, opened the session in presence of high government officials, administrators, owners of business, university professors, directors of non-governmental organizations, and some MCR producers. Prof. Kurt Rhyner of EcoSur presented a summary of the history and presence of the technology in the world, placing emphasis upon the struggle to guarantee stable quality in the production and use of MCR. The Minister of Science (Dr. O. N. Muchena) followed in declaring MCR as the launching point in the struggle to achieve the triple aim of lowering the cost of housing, substitutions of imports and creation of high quality craft production. Her intervention caused a great impression upon the participants, especially as a few months ago she bought MCR to use in the reconstruction of the roof of her mothers house in a town in the interior of the country, and found the price favorable. 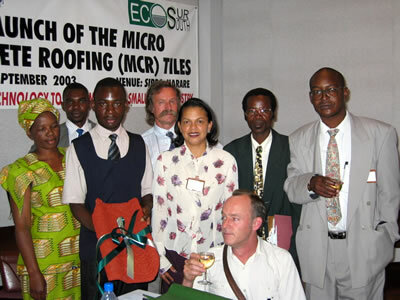 Dr. Kuchena emphasized the importance of evaluating the materials and technologies together, and drew attention to the fact that their institute has planned to make strong inroads into the MCR production market, creating their own brand, approved by the national MCR standards that have been legally established for several months. At the same time, he wishes to promote the use of rammed earth walls for which they have also established standards together with the National Commission of Standards and Norms. The South African architect, Peter Dunckley of EcoSur, spoke about the situation of MCR on the continent and drew attention to the importance of a coherent policy to support national decentralized production and, if possible, coordinate among neighboring countries. The practical note was provided by Maytee Campos, a Panamian woman who has lived twelve years in Zimbabwe, and who is the first successful commercial MCR producer in the country. She caused much surprise among the public and positive comments from the Minister of Science, because she (an accountant) did not have a technical education and, in spite of this, has been able to successfully establish a construction materials business. The Secretariat of the Presidency made a strong declaration in favor of using MCR, and congratulated SIRDC, that is going onto the market with a good product and assured government support. There were lively discussions in the work groups, but, above all, during lunch and the cocktails after the event, that leads us to think that MCR has a good future in Zimbabwe. In Zimbabwe MCR technology has had a varied fortune. Over the years, several workshops had been installed by different organizations, but the great majority have never passed beyond the experimental phase, often the result of insufficient training or rustic equipment. During my visit to Zimbabwe I visited workshops that are part of an international program and which have received moulds so deficient that they are unusable. Such experiences contrast dramatically to the workshops managed by Maytee Campos, SIRDC, and other small entrepreneurs that are producing good quality and have found markets for their product. In order to improve this situation, the week after the SIRDC seminar, EcoSouth gave a follow-up course directed by Peter Dunckley.